Copyright 2014 Swiftreach Networks, Inc. All Rights Reserved. The Swift911 Web Portal allows you register your contact information to allow you to be notified during an emergency or official outreach. If this is the first time using this portal, please register by clicking on the “Register Now!” button. Once you have filled out the online registration form and confirmed your email address you are registered to receive alerts. If you have already registered on this web portal and are returning to update your contact information, please sign in using the email address you used to register and the password you created during the registration process. If you no longer wish to receive alerts, please click on the appropriate unsubscribe link (Phone Calls, E-Mails, Text Messages). Select a language from the dropdown menu and the web portal interface automatically translates to the selected language. The Default Language is English. 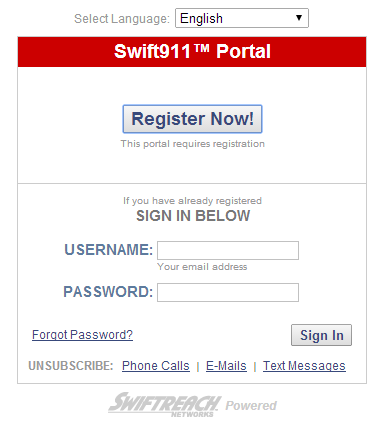 Click this button if you have not yet registered on the Swift911 web portal. This will bring you to the Register page and open up the registration form to fill out to register with Swift911. NOTE: During the registration process you will create a username and password, only the username and password created while registering will work to sign in to the portal. Enter the email address you used and confirmed through the registration process. NOTE: In order to sign in, you must have previously registered to the Swift911 web portal and have entered your web portal username and password. You will not be able to log into your profile unless you have already registered with Swift911. Enter the password you created during the registration process. Click on this reset your registered web portal password. If you have forgotten the password you created during the registration process, click the “Forgot Password?” link to reset your web portal password. Click this button to sign in to your contact profile. If you have successfully logged in, you will be brought to the My Alerts/Subscriptions page. Click on this link to prevent one of your phone numbers from receiving an alert from Swift911. You will be brought to the Unsubscribe: Phone Calls page. NOTE: If you wish to unsubscribe you will receive a confirmation code to enter, in order to identify you. This is for your security so no one else can accidentally or maliciously unsubscribe your phone, email address, or cell phone for text messages. Click on this link to prevent one of your email addresses from receiving an alert from Swift911. You will be brought to the Unsubscribe: E-Mails page. NOTE: If you wish to unsubscribe you will receive a confirmation code to enter, in order to identify you. This is for your security so no one else can accidentally or maliciously unsubscribe your phone, email address, or cell phone for text messages. Click on this link to prevent one of your cell phone numbers from receiving an SMS alert from Swift911. You will be brought to the Unsubscribe: Text/SMS Messages page. NOTE: If you wish to unsubscribe you will receive a confirmation code to enter, in order to identify you. This is for your security so no one else can accidentally or maliciously unsubscribe your phone, email address, or cell phone for text messages. Click on this link to go to the Swiftreach Networks Corporate web page, if you would like to access more information on our products and services.